Founded in 2016, Atidot is an InsurTech solution using artificial intelligence, machine learning, and predictive analytics to help life insurance companies optimize their books of business with actionable business insights. The company has more than a dozen employees and is headquartered in Israel, just east of Tel Aviv. The name means fortune telling in Hebrew. Improve pricing to maximizes the enterprise value of each customer. Atidot recently raised a $5 million Series A led by Vertex Ventures with participation from existing investors D.E. Shaw, Moneta Seeds, and Bank Hapoalim. Dror Katzav is co-Founder and CEO. Q. Dror, you’ve said that little of the data possessed by the life insurance industry is being utilized for strategic purposes. How is that possible? A. The biggest resources insurance companies have are one, customers and two, data. If they aren’t effectively using data they are losing one of their two biggest advantages. In the last seven years, I personally got married, had a kid, moved to a different house, took a mortgage, changed my occupation at least twice, and changed my employer. In no instance in the last seven years has my life company approached me with a proposition that relates to my new situation. When we started this company, we went to a lot of insurance carriers and asked them a simple question: if I had purchased a life policy from you seven years ago, and I was a loyal customer, what would you have offered me? The companies usually answer by saying they wouldn’t know. Then we asked them to assume that what I bought seven years ago was a $200,000 policy. How much coverage should I have now? And they don’t know that, either. The answer to the question is important, because if I have too much insurance, obviously I could get better prices, and if I don’t have enough insurance you should sell me more. It’s important for the company to know that. So, they tell me the type of life events they are looking for and say let’s find them. They build a list of 10 – 15 attributes – house purchase, etc. And we are able to show them that many of these events, if they just had a better understanding of their own data, were things they could have identified already. I’ll give you a very good example – mailing address. You tell your insurance company that you want your mail to be delivered to a new address. This is so super back office that no one cares about it. But, just by looking at the two addresses and going into census data and public records I can tell you that the first address is a three bedroom in the city center, probably rental, and the second is a five bedroom in a suburb, probably owned by the resident and worth twice the previous address. Just hearing this, you can already imagine the life events. Now you have an insight. If you can give it to distribution you can say this is not an address change, this is probably a mortgage, the birth of a child, an increase in salary, a marriage, and people like him, or people like her, usually purchase at this point in time, this product. Now it becomes a different conversation with the customer. Q. Tell me more about what your platform does. A. What the platform is doing is helping the life insurance company to be disrupted without the disruption. What we do is we take the data from all the different systems and very quickly use machine learning and big data technologies to understand as much as possible. Stuff that used to be cleansed out or normalized or even neglected (and neglected data can be 60%, 70%, even 80% of the data) is aggregated to the customer view. Then we add to that data from external sources and start finding models that predict the insurance behavior of their customers. What we report back to the company is in two levels. One is to management and to the actuaries. We tell them what are the different risks, what are the different drivers. This book, most of the lapses are in this segment; most of the upsells are coming from this segment, under-insureds are in this segment, etc. The second is to distribution, saying call Dror because people like him usually by this product or take this action. This is what we do. We tell the insurance companies who among their customers need more coverage and the mirror image, who among their customers are likely to lapse, and why. Q. You are in production with a couple of carriers. Can you quantify performance improvements carriers are seeing, either in improving sales or in reducing lapses? A. I’ll share two results that companies allow us to share. One is for a South African life insurance company called Platinum Life. We analyzed about 1.5 million policies and we were able to predict lapse behavior about 14% more accurately than existing models. This translates – if you optimize the way you do lapse prevention and marketing segmentation for customers with high and low lapse rates – into a 30% – 35% increase in premium collection. In the other example, the company does not allow us to share their name but it’s one of the top ten carriers in the U.S. With them, we detected policy-owners who are probably under-insured and reached out to them through independent financial advisors who were part of their network. We were able to discover under-insurance pockets that can be summed up to over $1 billion in overlooked business. The conversion rates of financial advisors reaching out to those customers went up by over 150%. Q. What new features and capabilities are you working on? A. The new version of the platform will be released in the next two or three months. We are building now a version that is much more self-serve, in order to help mid-sized carriers – companies that might not have a lot of data experience but still wants to benefit from data science. It will help people who understand insurance – distribution, underwriters – leverage the capabilities of the platform without understanding data science. Q. How big is the market for your platform, globally? A. The dollar figure that we estimate is $40 billion.We see a lot of reports that say that carriers are willing to invest up to 4% of their premiums in digitization. Q. How much money do you estimate a mid-sized U.S. carrier is leaving on the table before it engages with you? A. From what we see, there are big opportunities. We see mid-sized companies losing hundreds of millions just from not reaching out and upselling existing customers. A simplified benchmark: 20% of the book is underinsured and when you bring them to the right level, you sell them an additional 30% – 50% of what they already own. So you can increase 20% of the book by 30%. Q. How has your platform, your algorithms been specialized for life insurance and annuities? A. It’s a good question. We believe the way for solutions to work is to be very focused and very vertically oriented. The founding team – we were two from Israeli intelligence and one chief actuary. My personal background is 11 years in data and intelligence, building data solutions. Barak Bercovitz, my co-founder, was coming from my unit. 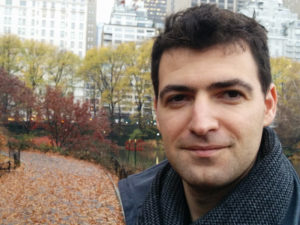 The third co-founder, Assaf Mizan, was the chief actuary of the Israeli Ministry of Finance. From the ground up, we’ve built the company based on data science and actuarial studies. But more than that, if you know that the data you relate to is for life insurance policies and annuities, you don’t need to train first, engineers and second, the system, to know what a policy looks like. When we come to the data and it says this is the face amount and this is the contribution, but then he took a loan and then he missed some premiums, but there’s a guarantee, and all the rest of it, well this is what we deal with on a daily basis. So we are not surprised by what’s in the data. The system is not going to throw errors up all over the place just because we saw a missing premium. Q. Is Atidot going to be more valuable for a direct-to-consumer distributor than for ones that can rely on agents? When the relationship is between the carrier and the consumer and your platform can automate the outreach, or at least indicate when the outreach needs to happen, I would think direct marketers would be very interested in this capability. A. Both can leverage the system. Obviously, we see a trend toward direct-to-consumer efforts, and if you can keep more of the value chain under one umbrella it is usually easier. It’s harder when you have to convince the carrier, who has to convince the wholesaler, who has to convince the financial advisor. Then the individual at the end of the line is a B2B2B2B2C. Direct to consumer is perhaps the most obvious use case, but from what we experience, over the short-term and even the mid-term, agent distribution is not going anywhere. And, they are looking for value add. They are looking not just at who can provide products with lower prices, but who can add some additional value. We are working with multi-channel producers, as well, of course. Q. Which internal systems, generally, are you drawing data from? Who’s doing the integration work, Atidot or the carrier? A. It’s the policy admin, it’s the CRM. If the carrier has other resources that might be useful we will take them. The answer to your second question is usually that if they are resource constrained we will do it. If you don’t have your systems ready, we will come and help. Again, there is an advantage in being focused on the vertical. It’s not like I specify how I need the data and it’s now a year’s project to prepare it, clean it, normalize it. We know what a policy admin data dump looks like. Q. In my experience, though, data quality can be an issue inside insurance companies, and with AI, data quality can be everything. A. We take both structured and raw data since a lot of the signals might be found in the raw data. All this nonsense data has a lot of signals that you might not have considered when you cleaned the data. This is what we are looking for. We have automated a lot of the process, but we do love the fact that there are additional signals coming from the data. I’ll give you an example. In one case, we got data from a certain carrier, and after some analysis, one of the insights that came up was that policies that customers were paying for from a certain type of account (let’s say a current account) at a certain bank had a different behavior. It can give you different signals, just the fact that data fields might not be filled. We looked at contact details, and said to one of the companies, customers for whom there is no cell phone, no home phone, no work phone, no email, have a certain behavior. It may mean there is a certain agent in a certain channel that is causing that to happen. So it’s an interesting insight, even in the non-cleansed data. Q. Which external sources of data do you bring to the table? And which sources of data have you found to be most predictive? A. Again, being focused on the industry, we are looking for data sources that give you a lot of information while still being segmented and generalized and not personalized. For example, we would gather financial market indicators and a lot of data about certain addresses or demographics. We also gather data that would help us structure the text within the policy. In one case, out of 100,000 policies, we found 70,000 different types of occupations. Are “math teacher” and “teaches math in public school” the same occupation? An analyst could do this but it would take a lot of time. A system could do it in seconds. I can also tell you that a math teacher living in New Jersey in a certain city would have certain salary level, approximately. And if census data tells us the approximate worth of this address, we can start extrapolating the financial situation of this person. A lot of it is about getting the external data sources – generalized data, public data, open data – and by augmented it to certain situations, you get a lot of benefits. Q. Are your algorithms starting from scratch with data from each new client, or do new carriers benefit from what your algorithms have learned previously? A. There are a lot of generalized insights that can be reused relatively easily – for example, the fact that I understand missing premiums – but not someone’s specific information. But, here is a question of privacy and IP. For that matter, if I am working for John Hancock, for example, John Hancock customers are John Hancock customers. So I am doing the analysis like I am doing it for everyone else, but the last mile of translating it to Dror who is a customer of John Hancock, is done just for John Hancock. Q. Who is your customer inside the carrier? It seems like you’re focused on marketing and sales, and possibly product. A. In most cases, you have to get some consensus with a group of people. The general case is that the customer comes from the business unit. The business unit depends on the company, the way distribution works. Could be marketing, could be sales, could be channel management. Usually involves someone from actuarial, to make sure the data makes sense, the model makes sense, and to validate the process. And, usually someone from IT to help us through the technicalities. Q. Do you consider the platform insurance technology or marketing technology? A. From a positioning point of view, insurance technology because it’s not just for marketing insights. We are not competing on who has better marketing insights, but on who can translate them better to insurance insights that can actually drive profitability. Q. Would you characterize this as artificial intelligence, machine learning, or predictive analytics? Or is it all three? A. Those terms are usually being confused. I’ll give my perception of it but I know people use different terms for different occasions. The way I’m looking at it, maybe the biggest difference between predictive analytics and machine learning and artificial intelligence is the feedback loop. If we are doing an experience study, it’s predictive analytics. We are projecting results, you are projecting results, we’ll see whose projections are better. Now, what if I connect it to the field and start incorporating feedback? In one of our cases the feedback started coming back and when one channel is life insurance brokers and the other one is financial advisors that sell insurance just as one of many products, it’s obvious that different people need different types of insights. If you provide this feedback back to the model and generate new insights based on this, now it becomes what is known as machine learning or artificial intelligence, because the feedback is resulting in adjustments to the models. We are doing all three. It depends on the way you implement the technology. Q. Can you find all the AI and ML talent that you need in Tel Aviv? A. The market is competitive. There is very good talent in Israel but everyone wants the good talent. One of our advantages is coming from the specific unit we are coming from. This unit keeps training and then sending out to the world very good engineers, machine learning experts, and also developers that have gained a lot of experience in very stressful, achievement-driven situations. The fact we are coming from those units – I served 11 years and Barak served 10 years – and we are coming from certain programs, it’s easy for us to recruit people who were soldiers or had soldier friends. We have good access to talent that others might not have. Q. You are a SaaS company. Are insurance carriers ready to allow their data into the cloud? Are you getting requests for on-premises installations? A. Surprisingly, we haven’t met the requirement to do on prem yet, but we did prepare for it. We did become a Microsoft partner; we are the highest level of Microsoft partnership so we can leverage all of the partner security, privacy, data protection services. Insurance companies have started to understand that they need to open up to the world. Even if it’s not cloud, it’s a cloud-like environment. I don’t really imagine taking machine learning solutions and installing them on a server in the basement. Q. You raised $5 million just last month. What is this new capital going to be used for? A. Two primary things. One is to set up the U.S. operation. We also hired two insurance veterans from the U.S. One is Martin Snow. Martin was an actuary at Prudential and at TIAA. The second is Steven Goldstein, who has a distribution background, also with Prudential. I am in the process of opening an office in the U.S. and also relocating. Q. Where are you putting the U.S. office? A. Currently in the Bay Area. Q. Why did you choose the U.S. for expansion, rather than Europe, which is geographically closer, or Africa, where you have a successful implementation with Platinum Life? A. The U.S. is more startup-ready because of the way the ecosystem is structured. We see in the states, the pace of the companies to make decisions is a bit quicker. Companies have a growth mindset not a preservation mindset. Q. But still, insurance carriers are notoriously reticent about engaging with startups. Which tactics are you using to overcome that resistance? A. The way to overcome that is, in our opinion, to show results really quickly. What we do is to say that in 100 days we start showing you results. We’ll do it on a limited basis. Maybe a small book of business or a niche market. Let’s experiment. It’s not going to be pricey and it’s going to be quick. But in 100 days, if I take you from me not seeing your data to your customers actually converting, then we have a different discussion. Q. In Europe, what are the implications of GDPR for you? A. We are prepared for it. We are doing some in Europe because many carriers are global. Although it’s a European regulation, I think it’s a smart move for us to be prepared for data privacy regulations. We make sure that the data we deal with is anonymized properly. It’s not PII, it’s not HIPAA. It’s just what we need to give you insight and nothing further. The translation back to a policy number, a social security number, and a first name and last name, is something that you do internally once we deliver back the insights. Q. I understand that there are more than 400 Israeli FinTech startups. Are they clustered around Tel Aviv? Is that the hub? A. I need to start with saying a word about geography. Israel is a small country. Calling somewhere a hub is an exaggeration. Haifa, Tel Aviv, Jerusalem, Beersheba. These are four big cities – one hour drive. Q. What are the strengths and weaknesses of the FinTech/InsurTech ecosystem in Israel? Is capital available at all stages? Are the incumbent institutions supportive? A. What’s great about Israel is that I think it’s probably the highest concentration of big tech players in one place, besides the Bay Area. If you have a startup in Israel and you want to chat about your idea with Amazon, Google, Facebook, IBM, HP – name it and they have an office here. Since the country is not that big, getting a meeting is two phone calls away, at most. This is one of the reasons why the ecosystem here is strong. It’s very easy to bounce ideas and get quick feedback. Because of that, a lot of venture capital firms are active in Israel and have offices in Israel. Starting up is easy. I think when it gets to bigger checks, then we start looking outside of Israel. You get the seed, the A, maybe even the B round in Israel, but then you should start looking outside, because then you need funding from firms that have access to different types of capital. About the insurance companies in Israel, they are not as big as the American ones or the European ones, but for us to get a meeting with any insurance company in Israel was super easy. It’s very helpful, because you can do it relatively quickly. Q. You participated in Plug and Play InsurTech. What was that experience like and would you recommend it to other insurance-focused startups? A. I think it was a great opportunity to see a lot of good people and companies in one place. For us, it was an opportunity to test the waters when we were thinking about coming to the U.S., to stay in the Bay Area for two months. Plug and Play can guarantee that I’m going to meet ten – fifteen companies in this time. For us, it was a great experience. One of the companies we’ve been able to sign was our first introduction at a Plug and Play event. Q. How did you get access to the insurance data you needed while the platform was under development? A. Unless you can actually train your model on real data, you will never see results. The South African company was very helpful. We agreed relatively quickly the South African company and an Israeli company that they would share their data with us, and the insights that we come across, we will share them for free. We came back to them after maybe nine months and said okay, let’s restructure the relationship. Now we know what type of value we can bring; now you know what type of value we can bring. Obviously, we are not going to charge you like a new client because you gave us a big favor in the beginning. But it shouldn’t be for free, either. A. What I would add is what I came to realize about insurance. First, that it’s super interesting, which was probably a surprise to many of my friends. And second, that there is a lot to learn. One of the key message that I learned and that I’m sharing is that if you want to do something in insurance, you have to really understand it. This is why it was crucial for us to have someone from the industry from day one. Otherwise, you’re going to miss a lot of things that you thought are going one way but are actually going the other. Life insurance, the place where people are saving for 40 years from now, is going to be risk averse. You have to relate to that. This is why we are not talking disruption. We are talking about how we can help those companies disrupt without disruption. We want to partner with them to transition them to the new age. This entry was posted in Insurance, Marketing and tagged AI, Plug and Play by jim. Bookmark the permalink.